Welcome to revlimiter.net! If you’re looking at this page, chances are you want to learn a little bit more about me and Sharka. And I’d like to say thanks! I really appreciate the interest. 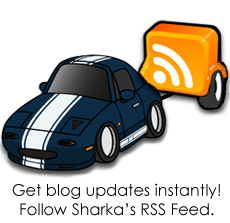 The best place to start is this post about Sharka’s First 10 Years. It sums up the focus of my automotive enthusiasm for most of my adult life pretty well. And there’s a lot of pix. July, 2000: Purchased Sharka, a 97 montego blue Miata with 51k miles on the clock. August, 2000: Installed rollbar. Attended my first SoloII event. I was hooked. 2001: Autocrossed in B-stock class, came in 1st place for the year in my region. 2002: Miatas were bumped to C-stock. I raced another season in stock and came in 1st again. 2003-2004: The mod bug hit me. I installed a lot of parts (mostly suspension) and raced CSP for 2 seasons. Came in 2nd and 3rd for the respective years. 2005: I tried to race in SM2. I bought and installed a somewhat rare coldisde supercharger. I learned to hate vacuum leaks and supercharger belts. My car became a basket case. 2006: Ripped out supercharger, went back to N/A. Installed Link ECU. Life went back to being enjoyable. 2007: Installed 99 engine and gave up on modifying my car to fit a specific SCCA class. I just drove and played with my car for my own enjoyment. Life got even better. 2008: Lost Sharka-the-97 in a freeway hit. Could have lost my life. Instead of following sanity and moving on with some other car, I chose to rebuild Sharka, better/faster/stronger. January, 2009: Purchased Sharka, a 95 montego blue Miata with 31k miles on the clock. Spent the next year rebuilding. This blog contains a lot of Miata projects (DIY), some rambling, some of my photography (mostly toys), and the occasional departure from Miatas to Linux, F1 racing, and Mazda3 maintenance. Hope you like it! And thanks for stopping by.